[S489] 1841 England Census, Lancashire, Staveley, England, GSU Roll 306914. [S485] 1851 England Census, Lancashire County, Dalton, England, GSU Roll 87302. [S494] 1861 England Census, Lancashire County, Dalton, England, GSU Roll 543090. [S471] 1871 England Census, Lancashire County, Dalton-In-Furness, England, GSU Roll 848078. [S477] 1881 England Census, Lancashire County, Dalton-In-Furness, England, GSU Roll 1342023. [S846] John Rigg, John Rigg Death Certificate. [S1166] Preston, The Bishop's Transcripts: shows John's father as Thomas Rigg. [S220] John and Ruth Rigg's Marriage Certificate: shows groom's father as Thomas Rigg. [S1166] Preston, The Bishop's Transcripts: shows John's mother as Elizabeth Rigg. [S489] 1841 England Census, Lancashire, Staveley, England, GSU Roll 306914, shows age 12 and born in Lancashire County. [S485] 1851 England Census, Lancashire County, Dalton, England, GSU Roll 87302, shows age 22 and Cartmel as birthplace. [S494] 1861 England Census, Lancashire County, Dalton, England, GSU Roll 543090, shows age 32 and birthplace as Cartmel. [S471] 1871 England Census, Lancashire County, Dalton-In-Furness, England, GSU Roll 848078, shows age 42 and Holker as birthplace. [S477] 1881 England Census, Lancashire County, Dalton-In-Furness, England, GSU Roll 1342023, shows age 52 and Holker as birthplace. [S846] John Rigg, John Rigg Death Certificate, shows age 58. [S220] John and Ruth Rigg's Marriage Certificate. [S494] 1861 England Census, Lancashire County, unknown cd2, England, GSU Roll unknown cd7. [S792] Ruth Rigg, Ruth Rigg Death Certificate, shows widow of John Rigg. [S224] Thomas Rigg, Birth Certificate File Number 128 (25 June 1852). [S494] 1861 England Census, Lancashire County, Dalton, England, GSU Roll 543090, shows age 8. [S471] 1871 England Census, Lancashire County, Dalton-In-Furness, England, GSU Roll 848078, shows age 18. [S477] 1881 England Census, Lancashire County, Dalton-In-Furness, England, GSU Roll 1342023, shows age 28. [S387] 1891 England Census, Lancashire County, Dalton, England, GSU Roll 6098588, shows age 38 and birthplace as Dalton. [S512] 1901 England Census, Lancashire County, Dalton in Furness, England, GSU Roll shows age 48 and birthplace as Dalton-In-Furness. [S224] Thomas Rigg, Birth Certificate File Number 128, Residence of Informant (25 June 1852). [S225] John Ashburner Rigg, Birth Certificate File Number 159 (30 June 1854). [S494] 1861 England Census, Lancashire County, Dalton, England, GSU Roll 543090, shows age 6. [S471] 1871 England Census, Lancashire County, Dalton-In-Furness, England, GSU Roll 848078, shows age 16. [S477] 1881 England Census, Lancashire County, Dalton, England, GSU Roll 1342022, shows age 26. [S387] 1891 England Census, Lancashire County, Dalton, England, GSU Roll 6098588, shows age 36. [S512] 1901 England Census, Lancashire County, Askam, England, GSU Roll shows age 46 and birthplace as Dalton-In-Furness. [S226] Hannah Mary Rigg, Birth Certificate File Number 462 (8 November 1856). [S494] 1861 England Census, Lancashire County, Dalton, England, GSU Roll 543090, shows age 4. [S471] 1871 England Census, Lancashire County, Dalton-In-Furness, England, GSU Roll 848078, shows age 14. [S477] 1881 England Census, Lancashire County, Dalton-In-Furness, England, GSU Roll 1342023, shows age 24 and birthplace as Dalton. [S387] 1891 England Census, Lancashire County, Barrow-In-Furness, England, GSU Roll 6098598, shows age 35 and Dalton as birthplace. [S283] Seth Smith household, 1900 United States Federal Census, New Haven, Connecticut, population schedule, Waterbury, ED 431, sheet 5, dwelling 58, family 107, shows age 43, birthdate as October 1857, and birthplace as England. [S286] Beatrice A. Mahoney household, 1930 United States Federal Census, New Haven, Connecticut, population schedule, Waterbury, ED 211, sheet 14A, dwelling 164, family 264, shows age at first marriage was 21 years old. She married in 1878. [S285] Hannah Smith household, 1920 United States Federal Census, New Haven, Connecticut, population schedule, Waterbury, ED 432, sheet 15B, dwelling 101, family 276, shows age 59 and birthplace as England. [S236] The Waterbury Republican-American, 18 Mar 1935, shows that she was born iin England. [S226] Hannah Mary Rigg, Birth Certificate File Number 462, shows residence of informant (8 November 1856). [S227] Unknown volume, Joseph Rigg's Birth Certificate: Birthdate and place, 6 apr 1861, unknown repository. [S494] 1861 England Census, Lancashire County, Dalton, England, GSU Roll 543090, shows age one month. [S471] 1871 England Census, Lancashire County, Dalton-In-Furness, England, GSU Roll 848078, shows age 10. [S477] 1881 England Census, Lancashire County, Dalton-In-Furness, England, GSU Roll 1342023, shows age 20 and birthplace as Dalton. [S387] 1891 England Census, Lancashire County, Dalton, England, GSU Roll 6098588, shows age 30 and birthplace as Dalton. [S512] 1901 England Census, Lancashire County, Dalton-In-Furness, England, GSU Roll shows age 40 and birthplace as Dalton-In-Furness. [S1087] 1911 England Census, Lancashire County, Dalton-In-Furness, England, shows his age as 50 and his birthplace as 55 Market Street, Dalton. [S227] Unknown volume, Joseph Rigg's Birth Certificate, 6 apr 1861, unknown repository. [S228] William Robert Rigg, Birth Certificate File Number 239 (21 March 1863). [S471] 1871 England Census, Lancashire County, Dalton-In-Furness, England, GSU Roll 848078, shows age 8. [S477] 1881 England Census, Lancashire County, Dalton-In-Furness, England, GSU Roll 1342023, shows age 18 and birthplace as Dalton. [S512] 1901 England Census, Lancashire County, Dalton-In-Furness, England, GSU Roll shows age 38 and birthplace as Dalton-In-Furness. [S221] Benjamin Rigg, Birth Certificate File Number 452, Residence of Informant (24 February 1865). [S222] Edward Rigg, Birth Certificate File Number 453, Residence of Informant (24 February, 1865). [S804] Septimus Pearson Rigg, Birth Certificate File Number 65 (8 September 1869). [S471] 1871 England Census, Lancashire County, Dalton-In-Furness, England, GSU Roll 848078, shows age 1. [S477] 1881 England Census, Lancashire County, Dalton-In-Furness, England, GSU Roll 1342023, shows age 12 and birthplace as Dalton. [S387] 1891 England Census, Lancashire County, Dalton, England, GSU Roll 6098588, shows age 21 and birthplace as Dalton. [S512] 1901 England Census, Lancashire County, Claughton, England, GSU Roll shows age 31 and birthplace as Dalton. [S1087] 1911 England Census, Lancashire County, Barrow-In-Furness, England, shows age 41 and birthplace as Dalton-In-Furness. [S790] Will of John Rigg: Catalogue Reference: BD TB File-No Title, Ref. No. BD TB/Wills Box1/192 Date: 1887. Description of Document: Copy Wills; Creator-Thomas Butler and Sons, Broughton-In-Furness. [S224] Thomas Rigg, Birth Certificate File Number 128, shows father as John Rigg (25 June 1852). [S983] England Births and Christenings: Thomas Rigg, 27 June 1852; Dalton-In-Furness; shows father as John Rigg, Ancestry.com. [S225] John Ashburner Rigg, Birth Certificate File Number 159, shows father as John Rigg (30 June 1854). [S983] England Births and Christenings: John Ashburner Rigg, 9 July 1854; Dalton-In-Furness; shows father as John Rigg, Ancestry.com. [S997] Family Search Website, online www.pilot.familysearch.org, England Baptisms, 1700-1900; John Ashburner Rigg; shows father as John Rigg. [S841] John Ashburner Rigg and Margaret Simpson Slater; shows husband's father as John Rigg, British Isles Vital Records Index, John Ashburner Rigg and Margaret Simpson Slater; shows husband's father as John Rigg. [S997] Family Search Website, online www.pilot.familysearch.org, England Marriages, 1700-1900; John Ashburner Rigg and Margaret Simpson Slater; shows father of groom as John Rigg. [S226] Hannah Mary Rigg, Birth Certificate File Number 462, shows father as John Rigg (8 November 1856). [S983] England Births and Christenings: Hannah Mary Rigg, 9 November 1856; Dalton-In-Furness; shows father as John, Ancestry.com. [S997] Family Search Website, online www.pilot.familysearch.org, Hannah Mary Rigg; shows father as John Rigg. [S619] Lynn Ransom Burton, Baptisms at St. Mary, Dalton in Furness, 1859-1866, Hannah Mary Rigg, 9 November 1856; shows daughter of John Rigg and Ruth. [S229] Certificate, Seth Smith and Hannah Mary Rigg marriage of 8 July 1878, shows father as John Rigg. [S997] Family Search Website, online www.pilot.familysearch.org, England Marriages, 1700-1900; Seth Smith and Hannah Mary Rigg; shows the bride's father as John Rigg. [S233] Hannah Mary Rigg Smith, Hannah Smith's Death Certificate, show her father as John Rigg. [S799] Lynn Ransom Burton, Baptisms at St. Mary, Dalton in Furness, 1856-1859, Elisabeth Jane Rigg, 23 January, 1859; Register: Baptisms from the Bishop's Transcripts, Page 81, Entry 642; Source: LDS Film 1040305. [S490] International Genealogical Index (IGI) Elizabeth Jane Rigg, 23 January 1859; shows father as John Rigg. [S983] England Births and Christenings: Elizabeth Jane Rigg, 23 January 1859; Dalton-In-Furness; shows father as John Rigg, Ancestry.com. [S997] Family Search Website, online www.pilot.familysearch.org, England Marriages, 1700-1900; Elizabeth Jane Rigg and William Robinson; shows the bride's father as John Rigg. [S227] Unknown volume, Joseph Rigg's Birth Certificate: shows father as John Rigg, 6 apr 1861, unknown repository. [S983] England Births and Christenings: Joseph Rigg, 23 March 1861; Dalton-In-Furness; shows father as John Rigg, Ancestry.com. [S800] Lynn Ransom Burton, Baptisms at St. Mary, Dalton in Furness, 1859-1866, Joseph Rigg, 23 March, 1861; Register: Baptisms from the Bishop's Transcripts, Page 67, Entry 529; Source: LDS Film 1040305. [S997] Family Search Website, online www.pilot.familysearch.org, England Marriages, 1700-1900; Joseph Rigg and Mary Eleanor Postlethwaite; shows the father of the groom as Joh Rigg. [S228] William Robert Rigg, Birth Certificate File Number 239, shows father as John Rigg (21 March 1863). [S800] Lynn Ransom Burton, Baptisms at St. Mary, Dalton in Furness, 1859-1866, William Robert Rigg, 14 March, 1863; Register: Baptisms from the Bishop's Transcripts, Page 117, Entry 936; Source: LDS Film 1040305. [S983] England Births and Christenings: William Robert Rigg, 14 March 1863; Dalton-In-Furness; shows father as John Rigg, Ancestry.com. [S230] William and Margaret Rigg's Marriage Certificate: shows father as John Rigg. [S221] Benjamin Rigg, Birth Certificate File Number 452, shows father as John Rigg (24 February 1865). [S800] Lynn Ransom Burton, Baptisms at St. Mary, Dalton in Furness, 1859-1866, Benjamin Rigg, 28 January 1865; Register: Baptisms from the Bishop's Transcripts, Page 159, Entry 1272; Source: LDS Film 1040305. [S983] England Births and Christenings: Benjamin Rigg, 28 January 1865; Dalton-In-Furness; shows father as John Rigg, Ancestry.com. [S222] Edward Rigg, Birth Certificate File Number 453, shows father as John Rigg (24 February, 1865). [S800] Lynn Ransom Burton, Baptisms at St. Mary, Dalton in Furness, 1859-1866, Edward Rigg, 5 Mar 1865; Register: Baptisms from the Bishop's Transcripts, Page 169, Entry 1350; Source: LDS Film 1040305. [S983] England Births and Christenings: Edward Rigg, 5 March 1865; Dalton-In-Furness; shows father as John Rigg, Ancestry.com. [S801] Lynn Ransom Burton, Baptisms at St. Mary, Dalton in Furness, 1866-1871, Ruth Ann Rigg, 22 July 1866; Register: Baptisms from the Bishop's Transcripts, Page 5, Entry 34; Source: LDS Film 1040305. [S983] England Births and Christenings: Ruth Ann Rigg, 22 July 1866; Dalton-In-Furness: shows father as John Rigg, Ancestry.com. [S997] Family Search Website, online www.pilot.familysearch.org, Ruth Ann Rigg; shows father as John Rigg. [S543] Alfred Whitehouse and Ruth Ann Rigg, British Isles Vital Records Index, Second Edition, Marriage FHL Film 1471900, Shows father as John Rigg (1863-1905). [S997] Family Search Website, online www.pilot.familysearch.org, England Marriages, 1700-1900; Alfred Whitehouse and Ruth Ann Rigg; shows the bride's father as John Rigg. 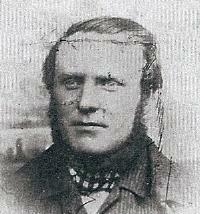 [S804] Septimus Pearson Rigg, Birth Certificate File Number 65, shows father as John Rigg (8 September 1869). [S801] Lynn Ransom Burton, Baptisms at St. Mary, Dalton in Furness, 1866-1871, Septimus Pearson Rigg, 5 September 1869; Register: Baptisms from the Bishop's Transcripts, Page 76, Entry 602; Source: LDS Film 1040305. [S983] England Births and Christenings: Septimus Pearson Rigg, 5 September 1869; Dalton-In-Furness; shows father as John Rigg, Ancestry.com. [S997] Family Search Website, online www.pilot.familysearch.org, England Baptisms, 1700-1900; Septimus Pearson Rigg; shows father's name as John Rigg. [S997] Family Search Website, online www.pilot.familysearch.org, England Marriages, 1700-1900; Septimus Pearson Rigg and Sarah Agnes Helm; shows the groom's father as John Rigg. [S983] England Births and Christenings: Reuben Octaves Rigg, 5 September 1869; Dalton-In-Furness; shows his father as John Rigg, Ancestry.com. [S541] Reuben Octiavius and Mary Hannah Comber, British Isles Vital Records Index, Second Edition, Marriage FHL Film 1471900, shows father as John Rigg (1863-1905). [S801] Lynn Ransom Burton, Baptisms at St. Mary, Dalton in Furness, 1866-1871, Reuben Octaves Rigg, 5 September 1869; Register: Baptisms from the Bishop's Transcripts, Page 76, Entry 601; Source: LDS Film 1040305. [S997] Family Search Website, online www.pilot.familysearch.org, England Marriages, 1700-1900; Reuben Octavius Rigg and Mary Hannah Comber; shows the groom's father as John Rigg.